Below is a reference guide for our school uniform. Using the menu below you can jump to a specific section of the guide, or scroll through the entire document. This guide is for students in years 9 – 11. 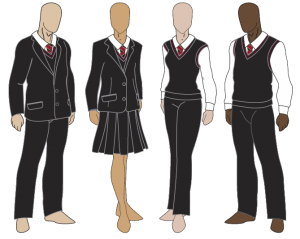 Sixth form students should refer to the Sixth Form uniform guide on the Sixth Form area of the website. The guidance is intended to aid staff to be consistent in the application of rules pertaining to uniform and also to help clarify the requirements of the school uniform code for both parents and pupils. The uniform code should apply equally to all pupils. Price & Buckland Ltd. are the sole suppliers of our Lower School uniform. Please note – the website will not be accessible until 19th August 2011. Black tailored jacket with the school badge on the breast pocket. There are two versions – standard (mainly for boys) and a ‘girl-cut’ style (for girls). This is a compulsory part of the uniform (except when pupils are informed otherwise such as when the weather is really hot i.e. above 25*C). Hoodies or other non-school uniform garments should not be worn below the jacket such as when travelling to or from home to school. Jackets may be removed in class at the discretion of the teacher. * there is a ‘flap’ where the pupil’s name can be written with a laundry pen under the spare button on jacket inside lining. 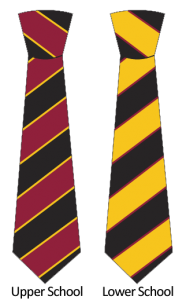 Black sleeveless sweater with maroon trim and bearing the school badge. This is a compulsory part of the uniform (except when pupils are informed otherwise such as when the weather is really hot i.e. above 25*C). The school tie must be worn. (A simple clip-on variety is available for Lower School if preferred). 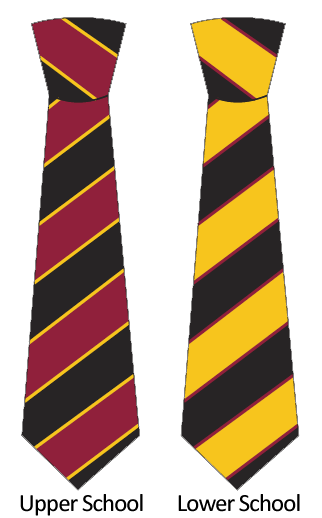 The Upper School tie there is a broad maroon stripe. The top button should not be left undone. A mainly black waterproof coat should be worn to school on wet and/or cold days. Ideally the coat should have a luminous or reflective strip to make it safer for pupils if walking home on a winter’s evening. The coat should not have any large logos. Hoodies in school will be confiscated on sight. Plain black (not grey) trousers. Black trousers are standard uniform for all students. * We understand that different students have different body shapes and sizes. However, the school skirt is available in a variety of lengths (16, 18, 20inch) and waist sizes. If you are unable to obtain a skirt which meets our guidelines then trousers must be worn. * except when issued by staff or for the rare occasion when a medical issue may necessitate (in this case, a medical note should be shown to your Head of School, who in turn will write a note which can be shown to staff). Girls should wear white or black socks or black/skin-coloured/opaque tights. Boys should wear black socks. Students may wear ONE metal stud OR small metal ear-ring (no larger than 0.3mm diameter) in each ear. The earring should be worn ONLY in the lobe of the ear. No other jewellery (including coloured necklaces, rings and bracelets) may be worn. No piercings other than ear piercings are allowed. You will be asked to remove incorrect jewellery. This may mean that wrist bands without clasps may need to be cut-off. Piercings should not be made during the school term – the hole may heal up as you will be required to remove the stud in school. No flesh-holes or horn-style ear-rings*, nose, lip, eyebrow sleepers or temporary piercings. * Flesh-holes: ear-rings which stretch holes in the ear beyond the normal range of traditional earrings are not allowed. Horn-style ear decorations where the hole in the ear is a similar size to the front of the ear, or where the back of the piercing extends excessively behind the ear, are not allowed. A single medical information or charity bracelet may be worn. No necklaces should be worn and may be confiscated if worn. * If you wear a charity band, be prepared to discuss your chosen charity. Other types of bands take away the value of people wearing legitimate bands which is to raise the profile of good causes. ** Medical bracelets should be worn at all times and should NOT be taken off for PE. Discuss with your PE teacher the use of a wrist band to cover the bracelet for health and safety. Arms, hands and nails should be clean and free from jewellery. We do not encourage students to wear make-up and nail varnish to school. Excessive or gaudy make-up is not suitable in school – pupils will be required to remove this immediately before returning to class. Hair should look natural with natural colours. Hairstyles which attract undue attention are not allowed. Long hair should be clean, tidy, and tied back when appropriate (e.g. for health and safety as in PE, Science practicals, Dance etc). Hats, caps and other headgear should not be worn on the school site, except in certain conditions. Sunglasses should have shatter-proof lenses and should not be unduly expensive. The school is not responsible for any loss or damage to such property. Belts should be worn for purpose i.e. to help a skirt or trousers fit better. Fashion belts (decorated, coloured or very large) are not allowed. School bags should be mainly black and designed for the purpose. Bags should not be a fashion item looking like a handbag. Ideally bags should be of a size so that they could fit inside the school locker for safe storage at lunchtimes. Bags should not have large logos. Students should seek permission from a member of staff if they wish to miss part of a lesson for sport and/or if they wish to wear kit to an afternoon lesson before an inter-school fixture. Students should not wear other clothing accessories after school until they have changed completely out of school uniform. This would apply to the use of electrical items like iPods too. During the second half of the summer term (and in periods of a prolonged heatwave) the school will declare a temporary adjustment to the uniform requirements. 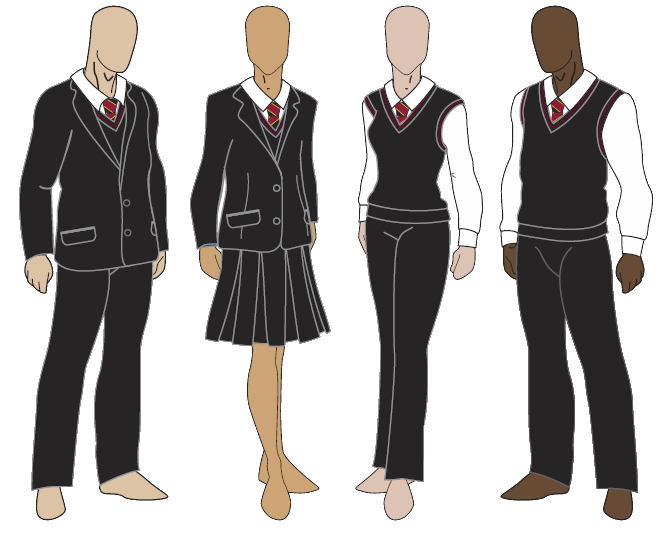 the tailored jacket should still be worn for the journey to and from school but may be removed once in school.